EPC Group’s industry recognized development practice covers the full spectrum of SharePoint 2019, Office 365, SharePoint Online and Microsoft Azure which enables us to develop enterprise solutions that are compatible for any architecture regardless of a public, private or hybrid infrastructure. Our tailored approach enables us to develop solutions for our clients with future compatibility and scalability in mind. Our development team also provides for deep expertise around the development of custom .NET solutions and applications that may reside outside of a SharePoint 2019 and/or Office 365 platform or interact with it to meet a specific business need for your organization. Development around legacy .NET applications as well as custom applications development on any widely available development framework including Java, etc. EPC Group provides full lifecycle services for custom application development using the full set of Microsoft technologies. When you partner with EPC Group for your Custom Application Managed Services needs, EPC Group will provide consistent and manageable solutions for all of your custom development needs. 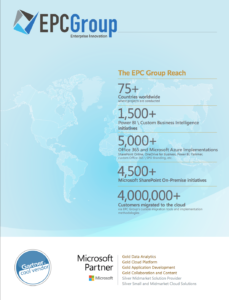 EPC Group will work as an extension to your existing development team or as your dedicated Microsoft Technologies expert. The custom application managed services starts by identifying your organization’s needs. From there we will create a roadmap and provide detailed planning and estimations on any and all custom applications that are needed. All of EPC Group’s Managed Services packages are tailored to your company’s specific needs and we will work with you to put together a detailed package that is both cost effective and robust.